One of the most contentious areas in a homeowner's project. 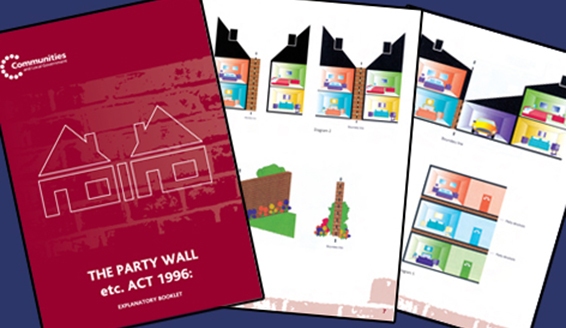 The Legislation that dictates what you should do when working on or near a party wall. This ACT is designed to be an "enabling" ACT, meaning that it's intention is to keep projects moving forward and engender good relationships with neighbors. This is something that you need to determine early on, we can help you with this. But essentially if you are building on or near a Party Wall, or intend to build near a boundary, then you should speak to us to help you find out. Once we know it does apply then we need to send out the correct notice with the correct information about the works and land ownership details. It is vital to be correct so there is no chance of invalidation further down the road. It now depends on how your neighbour responds. They may accept the notice maybe even with some alterations to the work and put this in writing, at that point you might just need to finish the notice period and start work. If they disagree or don't reply then you will need to form a Party Wall Award. If you neighbor is agreeable, you can appoint us to act as "Agreed Surveyor" for you both and we will form the Award for you and then "serve" it so that it has been invoked. If not agreeable then we can act on your behalf with the adjoining owner's surveyor to form and then serve the Party Wall Award. The Award is a formal agreement as to what works you will carry out and how you will control the affect on the neighboring property. The Award that we form will also include a condition report for your protection because it can be used to establish if any damage has been done to the neighboring property or if it was already existing. It is true that a Partywall Surveyor does not need to have a formal qualification in the industry, but we have found that with a qualification comes a superior knowledge. That knowledge can give helpful insights on the nuances of the Party Wall etc ACT 1996. We have had advanced training in how the legislation should be applied and after having our portfolio assessed and passing the exam we have attained the accreditation MFPWS. We will work to find the most pragmatic solution to get the project moving, whilst at the same time ensuring that the legislation is being applied correctly.